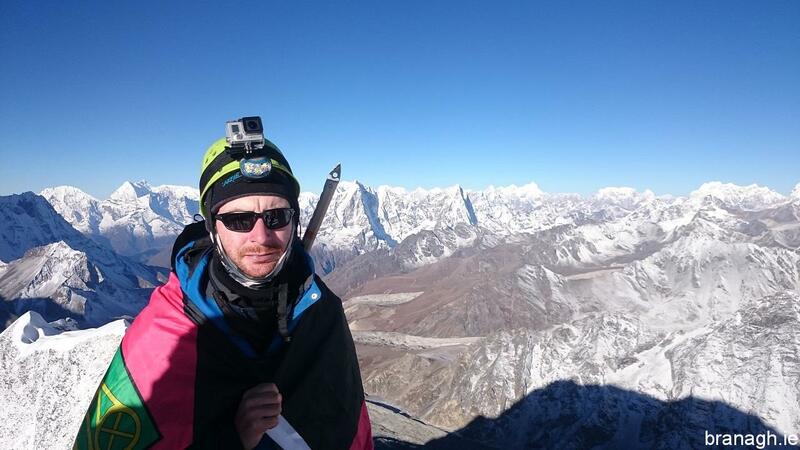 My Island Peak journey began months before I arrived in Nepal. I had learned how important training was from my experience the previous year at altitude on Kilimanjaro. I wanted to be in the best possible shape so that not only would I succeed in my attempt but also be in a position to really enjoy the experience. The key when training for such a trip is to make sure your legs are well conditioned to walking for long periods, both up and down hill. For Island Peak there is also a lot of importance on the strength of your calf muscles for the ascent of the headwall in crampons. Needless to say, most of my training would take place in The Mournes. For no particular reason at all I picked the Slieve Binnian circular route from Carrick Little car park as my main training ground. In the weeks and months leading up to the trip I was carrying an increasing amount of weight in my Osprey backpack. Using dumbbell weights wrapped in a towel I built this up to about 18Kg. On the ascent I often walked only on the balls of my feet to place extra strain on my calves in preparation for the headwall on Island Peak. I was on Binnian at least once a week. Most other days I was busy working up a sweat on my rowing machine at home. I went on the trip with Ian Taylor Trekking. I found Ian and his team to be absolutely fantastic on the trip and also in the weeks and months beforehand with training tips and advice. The Island Peak part of the trip began in Pheriche at 14,340ft, where our Everest Base Camp journey ended. There was a very distinct line between the two parts of the trip. In Pheriche we split off from our main Everest Base Camp group in the morning as they began their journey back down the valley toward Namche, Lukla and eventually home. At that point there was just five of us left who would be making our way to Island Peak, myself and a young Australian man along with three Sherpas. 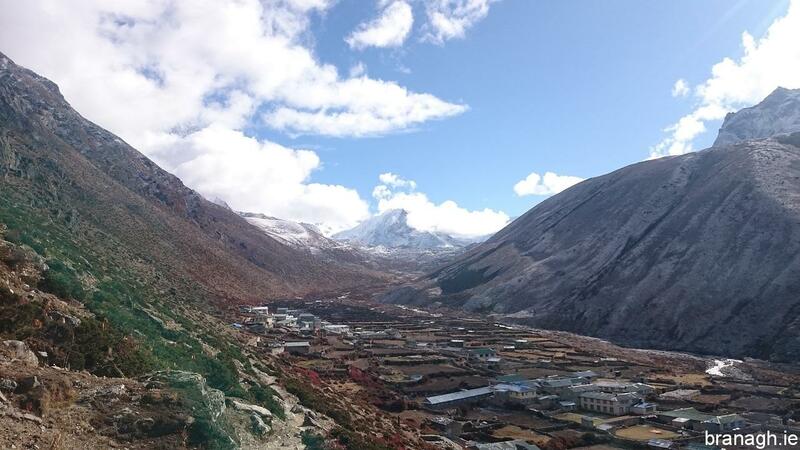 That day we would be trekking up to Chukhung at 15,518ft via Dingboche. 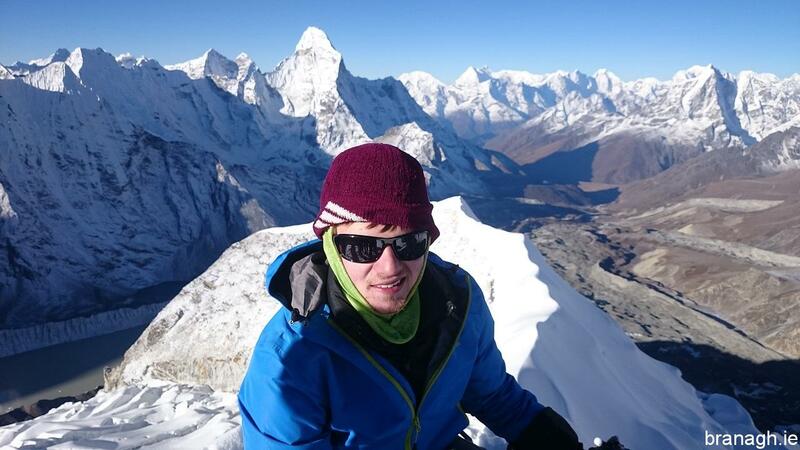 We had been up to Chukhung several days earlier for some training while we were staying in Dingboche on the way to EBC. The first time we made the journey to Chukhung I found the altitude tough. As we began the trek up this time however, I felt fantastic, almost as if I was back at sea level. 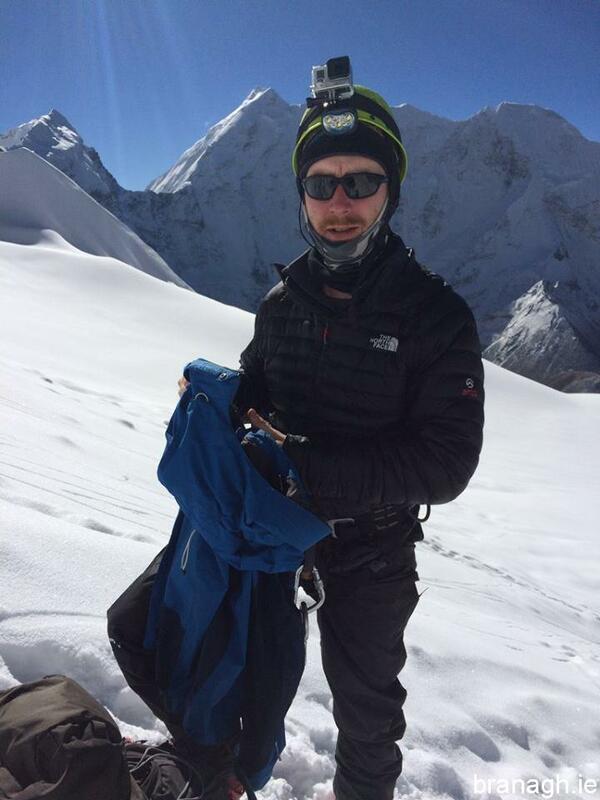 The difference was that my body had more time to acclimatize by this stage, especially after ascending to 18,519ft on Kala Patthar the previous morning. We hiked up the small hill to Dingboche fairly quickly, where we stopped for coffee before setting off further up the valley to Chukhung. We arrived early afternoon and had lunch before taking a few hours to rest and organise what gear we would be taking to Island Peak. We would be taking only what we needed to climb Island Peak and leaving the rest securely stored at the lodge in Chukhung. 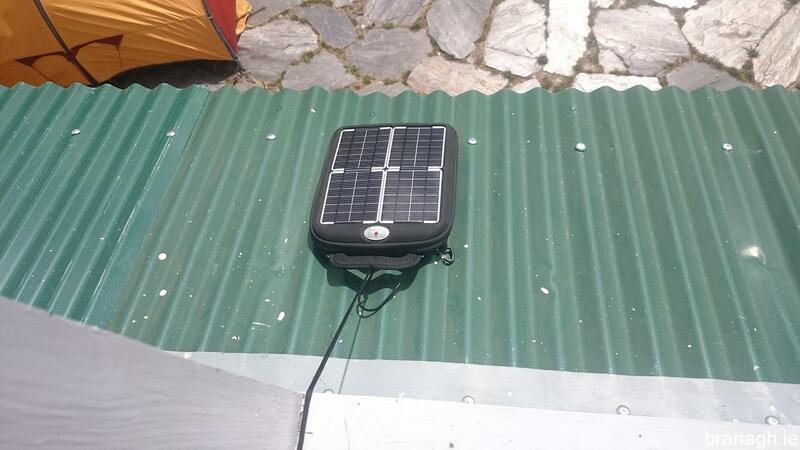 I also took the opportunity to place my solar charger in the sun for a few hours to make sure I had fully charged batteries for Island Peak. That evening in the lodge was much quieter than we had been used to with the large EBC group. I think we were also a little anxious about the task ahead. We had overheard another group talking about how they failed in their Island Peak summit attempt due to the very deep snow conditions only the day before (October is post monsoon). To come this far and be unable to reach the summit would be absolutely devastating. Next morning we were in no big rush to leave as Island Peak base camp was only a few hours trek from Chukhung so we left around mid morning. That gave us lots of time to pack up our gear. I didn’t find the trek to base camp overly enjoyable. We walked mostly along moraines. It was quite cloudy and the scenery was just not as spectacular as it had been on previous days. We arrived at base camp late afternoon to be greeted by some hot lemon. Base camp at 16,896ft sits in a narrow valley. There was a bitterly cold wind blowing through the valley so the hot lemon was a welcome treat as the tents were being pitched. We were still feeling the cold after getting into the tent for shelter so we got into our sleeping bags and quickly fell asleep for a couple of hours until dinner time. There wasn’t much else to do in camp. Dinner was good because I found that the digestion process really warmed me up and I felt better afterwards than I had for much of the day. After dinner we killed some more time with chatting and checking our gear. We attached our Gopro camera mounts to our helmets in preparation for the summit push. 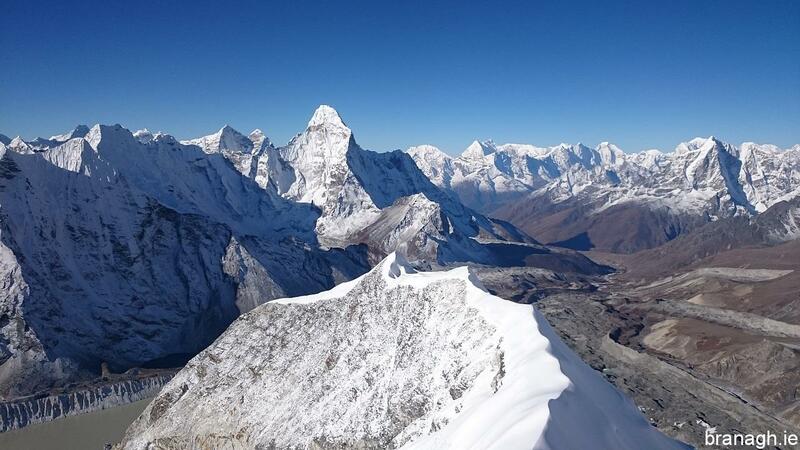 Many groups spend two nights at Island Peak base camp before a summit attempt, to allow for more training and acclimatization time. 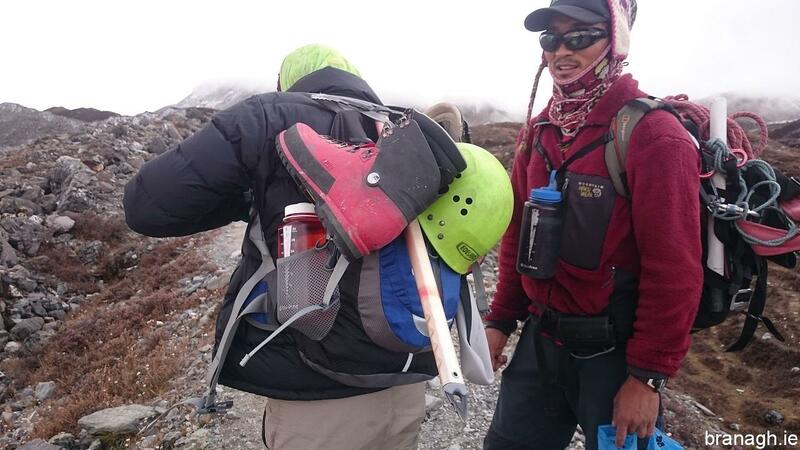 Based on our condition, our demonstrated ability and the weather forecast, our lead Sherpa decided that we would push on up to high camp after just one night at base camp. The first couple of hours after breakfast were spent doing some extra rope training before we began our ascent up to high camp. The route to high camp is steep, and zig zags back and forth. It was very tiring. The view behind us as we ascended became more fantastic with every step upwards though. 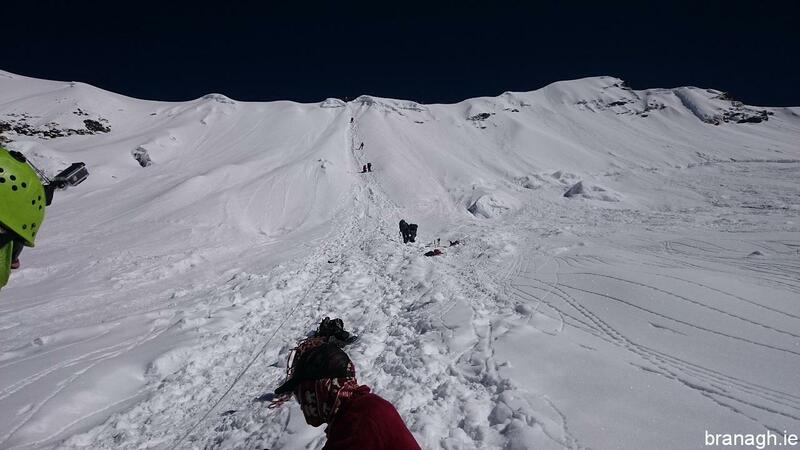 High camp at 18,044ft is on very steep, rocky terrain. Tents appeared to be randomly placed on any reasonably flat piece of ground big enough to fit them, tied down using the ample loose rocks available. We arrived early evening. There wasn’t much to do at high camp either apart from rest, eat and a final check of our gear. At this point I replaced the memory card and battery in my Gopro with fresh ones for the summit push. After dinner we prepared for a few hours sleep. We planned to start at 2.30am. 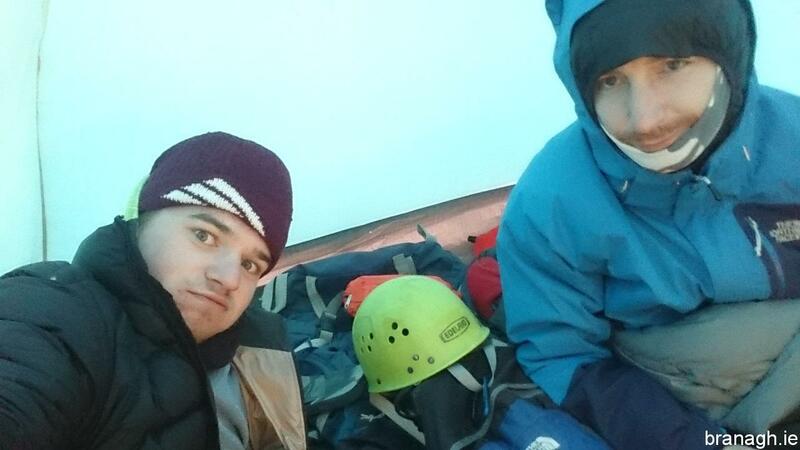 The Sherpas brought us some breakfast in our tent before our summit push. They also gave us some hot drinking water for our Nalgene bottles. I have an insulated sleeve for my Nalgene bottle after learning the hard way on Kilimanjaro the previous year, what can happen to drinking water in extreme cold at high altitude at night. It was around 2.30am when we were ready and set off toward crampon point. The route from high camp to crampon point follows a steep gully. There is a lot of scrambling and many steep drops. I didn’t realise just how unforgiving the route was on ascent because I only had my headlamp to guide me. Finally we crossed the narrow, challenging outshot of rock that leads to crampon point. I hadn’t noticed the cold since I had left high camp because the climb was very physically demanding and I was also being warmed by the odd sip from my Nalgene. At crampon point however we stopped and had time to start cooling down. It was bitterly cold. I think the temperature was around -20C. It was still some time before sunrise. I put on my down jacket and my heavier North Face gloves. We probably spent around twenty minutes at crampon point, putting our crampons and harness on, getting roped together and getting our Gopro’s ready to start shooting. The glacier was totally covered in snow which took the energy out of every step. I found it very tiring and was just waiting for the first hint of sunrise, for the energy and warmth that I knew the sun would bring. By the time we reached the base of the headwall there was a little light in the sky. It was soon after joining onto the fixed ropes that I was able to turn off my headlamp and make use of the approaching daylight. Now I felt strong. Now I felt motivated, a little too much though it would turn out. I ascended up the first two thirds of the headwall very quickly as I could see the summit not far away. This burst of “summit fever” severely drained my energy though and I hit the wall. The remainder of the way to the summit would be absolutely exhausting but stopping was never ever an option. While on the headwall I watched the sun rising in the Himalayas around me. That was a view that words cannot describe. The realisation of where I was and what I was doing at that point is something I will never forget. Along with my exhaustion, I was overcome with emotion. I have no shame in saying that there were some tears behind my sunglasses on that headwall and also later when I was on the summit. The entire trip and all the planning and training for months beforehand was all in preparation for this point, and I was going to make it to the top. The summit ridge was the last obstacle to overcome. Only about a foot wide, like a knife edge it would take me the rest of the way to the summit, stopping every few metres to move my safety line past the anchor points. I reached the summit at 20,305ft around 7am. By that stage the sun was fully up and the views were breathtaking. 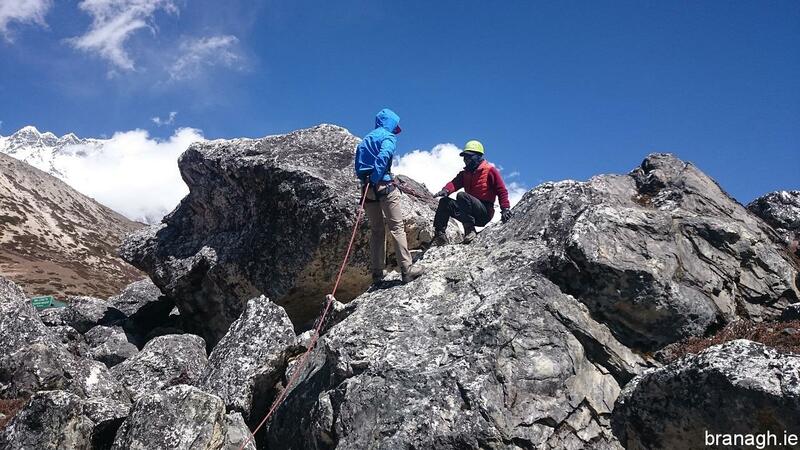 We took photos and waited for other climbers to reach the summit. We had been ahead of most other climbers that day. We spent about forty minutes enjoying the summit, taking photos and waiting for other climbers to arrive and clear the route before starting back down the summit ridge. By the time I had abseiled down to the base of the headwall the sun was getting very hot so we stopped, removed some layers, drank some water and fueled up on some snacks before crossing the glacier back to crampon point. There we had another long rest. We had summited very early so we were in no rush back down. Looking back up the headwall after abseiling down. 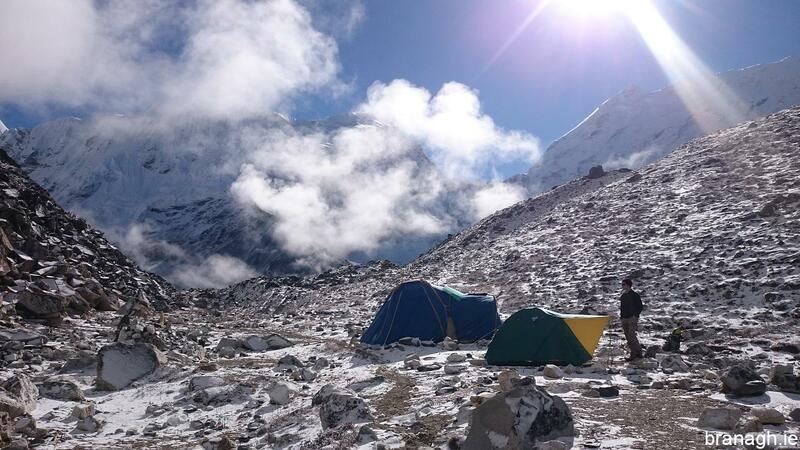 I collapsed into the tent back at high camp where I slept for a few hours, through the midday sun. Due to the heat in the tent while sleeping, the climb and probably dehydration due to the limited availability of water at high camp, I felt absolutely awful when I woke up, totally exhausted. 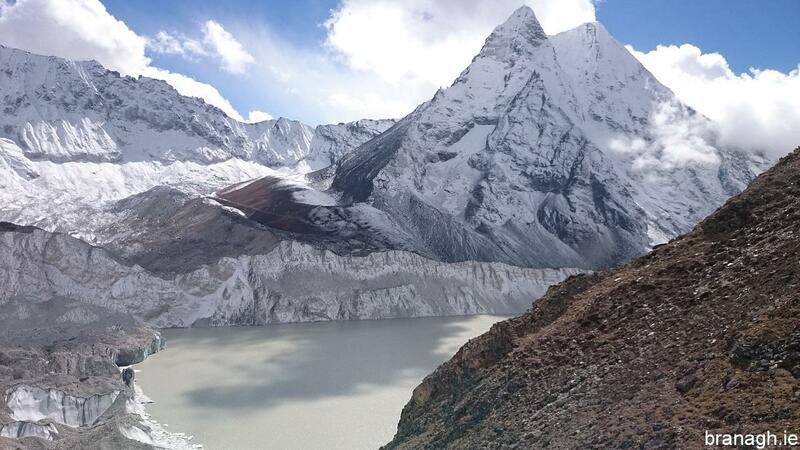 I knew however that we had to get back to Chukhung for a proper rest and the only way I was going to get there was by trekking, so I picked myself up, put my aches, pains and tiredness aside and started moving. The trek back to Chukhung felt very long with frequent rest stops. When we eventually got to the lodge I bought a bottle of full sugar Coke and a packet of Pringles. Such items are hugely expensive so high on the EBC trail but a luxury I felt I had earned and that my body was craving. The next morning, after sleeping like a baby and refueling with food and water I felt fantastic. Most people would not descend all the way from Chukhung to Namche in one day but we felt strong that day so we did descend all the way to Namche. Being honest, the other reason we descended so fast is because there is a bar in Namche and we really wanted a beer! !